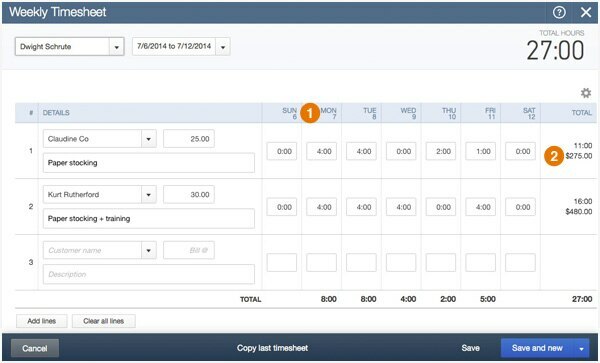 In weekly timesheets, an employee’s billing rate now autofills when that employee is selected. Also dates appear under days (1), making it easy to see which week you’re entering data for, and dollar subtotals appear per row (2), to show how much you’re billing per customer. The sales form description field now also wraps around. No more horizontal scrolling. Clicking a sales form field (like Address or Description) now automatically selects everything in that field, so you can quickly delete it or copy/paste it elsewhere. Deposit summary changes mean there’s now no maximum number of items, and the credit card type now prints. Your page position is remembered when you scroll down a long list (like the customer list), go to another page, and then come back. The class and address from a quote now transfers to an invoice. The service date from a billable expense now transfers to an invoice. Fixes to various other features include recurring transactions with incorrect due dates, recurring transactions with an interval of Annual not saving the correct day of the month, and not being able to create a statement from the customer detail page when the customer has a $0 balance. So what’s next? We’ll be bringing you column resizing in more tables, recurring transactions including the email field, and improvements/fixes to timesheets. If you have an idea to submit or want to provide feedback, remember that you can do just that by clicking the Gear icon in QuickBooks, and then clicking on Feedback. This is the official way to get your ideas recorded and worked on!